"Sampath Speaking" - the thoughts of an Insurer from Thiruvallikkeni: Delhi badly affected by smog ~ and CM is busy !!! Delhi badly affected by smog ~ and CM is busy !!! Not sure whether you are following Ranji matches these days ! At Shaheed Veer Narayan Singh International Stadium, Raipur, Baroda collapsed sensationally against the medium pace of Aswin Crist and K Vignesh to go from 71 for 1 to 93 all out against Tamil Nadu. In response, captain Abhinav Mukund’s century led Tamil Nadu to 337. The first day’s play between Bengal and Gujarat at Feroz Shah Kotla and between Hyderabad and Tripura at Karnail Singh Stadium were affected. The sun came out but yet there was no match ~ and can you state the reason for stoppage ? - Manoj Tiwary and Pragyan Ojha are seen in this photo..
Players complained their eyes burnt when they went into the middle. 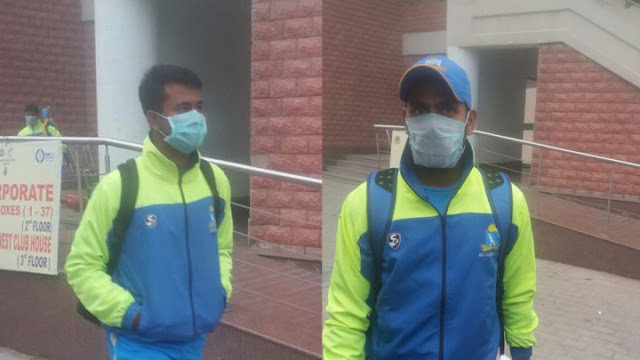 Bengal players were seen leaving the ground wearing masks. "This is the first time something like this happened in my career," Bengal captain Manoj Tiwary said. Sometime back, I had posted about the Margazhi season and the smog that envelops. Smog is a type of air pollutant. The word "smog" was made as a portmanteau of the words ‘smoke and fog’ to refer to smoky fog. About a century ago it was known as pea soup fog, a familiar and serious problem in London from the 19th century to the mid 20th century, caused by the burning of large amounts of coal within the city; smog contains soot particulates from smoke, sulfur dioxide and other components. 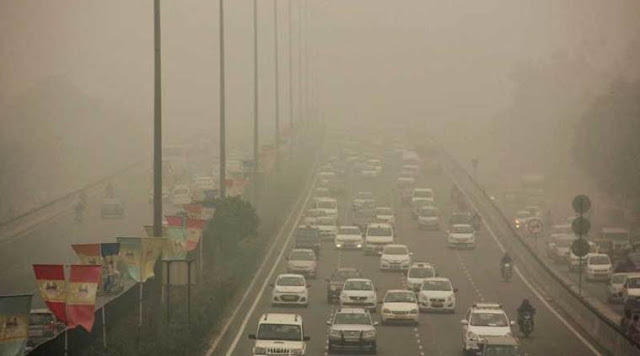 Modern smog is a type of air pollution derived from vehicular emission from internal combustion engines and industrial fumes that react in the atmosphere with sunlight to form secondary pollutants that also combine with the primary emissions to form photochemical smog. Smog is a serious problem in many cities and continues to harm human health. Sometime back, there were reports highlighting air pollution in China, which according to the U.S.embassy index, had hit a dangerous particulate concentration of 497. Chinese Premier Li Keqiang said pollution is a major problem and the government will “‘declare war’’ on smog by removing high-emission cars from the road and closing coal-fired furnaces. Pollution is ‘‘nature’s red-light warning against the model of inefficient and blind development,’’ Li said in his work report at the start of this year’s National People’s Congress in Beijing. There was to be a “smog insurance” product too being introduced there. All that was read with assumed insignificance – as it was alien to us. The stoppage in match is due to ‘Smog’.. .. .. even for a city considered one of the world's most polluted, the Indian capital hit a new low this past week. Air so dirty one can taste and smell it; a gray haze that makes a gentle stroll a serious health hazard. According to one advocacy group, government data shows that the smog that enveloped New Delhi was the worst in the last 17 years. The concentration of PM2.5, tiny particulate pollution that can clog lungs, averaged close to 700 micrograms per cubic meter. That's 12 times the government norm and a whopping 70 times the WHO standards. The Delhi winter, once a glorious time of clear — crisp days that meant holidays and weekends spent picnicking in its many public parks — is now a time of annual health woes. As millions struggle with hacking coughs and burning eyes, many schools across the city have either shut down or ended all outdoor activities. Doctors have asked people to stay indoors during the worst days. Today’s media reports [this is excerpted from MSN] state that Delhi chief minister Arvind Kejriwal has said that in view of the intense air pollution in Delhi, all schools will remain closed for three days and the odd-even road rationing scheme may return. All constructions and demolitions will banned for 5 days, water will be sprinkled on roads and strict action will be taken against the burning of trash, the Chief Minister said today (6.11.2016) after an emergency cabinet meeting. As he is wont, the Delhi CM tried politicising the issue blaming the Centre - Calling Delhi a "gas chamber," Chief Minister Arvind Kejriwal said the Centre needs to intervene to help control the smog that has enveloped the city since Diwali. As visibility dropped to a distance of 200 meters in the national capital on Sunday, Chief Minister Arvind Kejriwal held an emergency cabinet meeting at his home which was attended by all cabinet ministers and senior officials of health and the environment department. Hundreds of people, including children, staged a protest at Jantar Mantar on Sunday, demanding that the government to take effective initiatives to curb the rising air pollution. The level pf PM 2.5 -- tiny particles that can clog the lungs and worsen heart ailments is close to 700 micrograms per cubic metre. This is 12 times above the government norm and 70 times over the one advocated by the World Health Organisation. Saturday witnessed the worst air pollution of the season -- breaching the safe limit by over 17 times at several places. Around 1,800 municipal schools were shut in the capital on Saturday. Delhi government says road rationing will not control this smog since this is being caused by crop stubble burning in neighbouring Punjab and Haryana. The burning of paddy stubble in the fields is banned but attempts to impose cash fines on farmers responsible for the violation have been difficult. The farmers maintain it is cheaper to burn straw on the fields than hire people to carry it away. So, all is not well with Delhi – and its CM has better things to concentrate ! 6th Nov 2016 @ 17.15 hrs. Photo credits : Cricinfo & Indian Express.